We know technology is shrinking, but this is ridiculous. 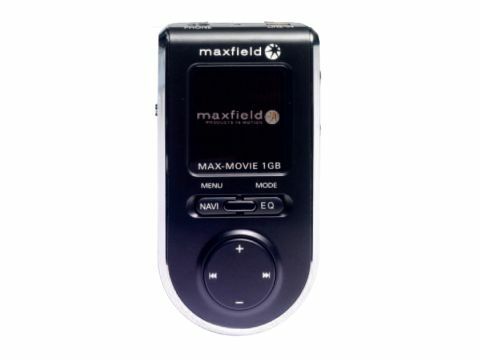 It just 69mm long, MaxField's Max-Movie media player is no bigger than a matchbox, but somehow it packs a lot of features into its diminutive frame - 1GB of flash memory, playback of movie and audio files, FM radio tuner, a photo viewer, voice recorder and even an alarm clock. Despite being the same size as a Christmas cracker gift, it certainly isn't built like one. The Max-Movie is robust enough to withstand the inevitable butter-fingered encounters with the floor, while its black casing and silver trim make it look very funky indeed. The 260,000- colour screen measures a cute 1.25in and uses Organic Light Emitting Diode (OLED) technology. Realising the limitations of a device this small, Maxfield has kept the front nice and simple, but while the circular skip/volume pad is easy to use, the buttons above it are fiddly, particularly the silver Enter key. It can handle a surprisingly wide range of file formats, such as MP3, WMA (DRM-protected or not), OGG Vorbis, MPEG4, JPEG, DiVX and AVI. You can connect the unit to your PC via USB 2.0, but like several others in this group test, video files can't be transferred in their original form using the 'drag and drop' method. They have to be converted into a player-specific MPEG4 format before they can be played, which is very time-consuming. However, MP3, WMA and JPEG files don't have to be converted. Among its other features is an internal WMA recording mode, from an external source or from the FM radio tuner. The internal memory holds up to 63hrs of recordings. There are also sleep and wake up functions and the built-in battery provides up to 15hrs playback. All of the different functions are easily accessed, though the single list of files isn't labelled very well. The simple onscreen menu graphics is surprisingly colourful and striking for such a mini screen. When playing video however, the Max-Movie fails to impress as the screen is far too tiny for the pictures to be enjoyable. Viewing a selection of trailers downloaded from the DiVX website (Ultraviolet, The Da Vinci Code, Ice Age 2), we found pictures to be blurry and indistinct, added to which the unit has to stretch them vertically to fit the 4:3 screen. While impressed that the unit offers video playback, we can't imagine who'd be happy to peer at videos on a screen this size. Then again, video is only a secondary consideration for the Max-Movie. Its primary strength is music playback (sound quality is excellent), and this takes on a whole new dimension when the SRS WOW mode kicks in. Add to this clear, crisp FM radio reception and you've got yourself a terrific little, portable audio player. On the whole, we have to admire the diminutive Max-Movie. Even if its size proves to be its ultimate downfall for video and photo viewing, its music playback capabilities make the player a worthwhile purchase.